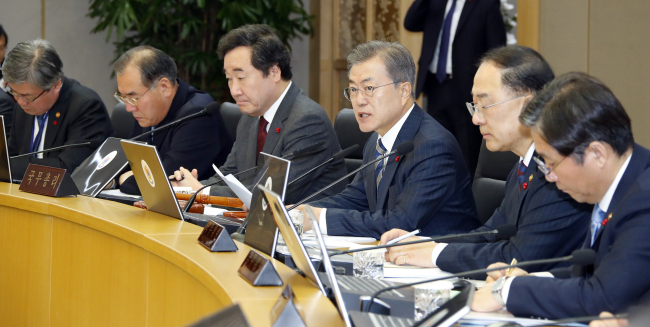 President Moon Jae-in on Tuesday called on government ministries to address economic issues, stressing the importance of local economies. Speaking at a Cabinet meeting held in Sejong, Moon said that while the country’s macroeconomic indexes are stable, the country is experiencing difficulties in employment and other areas linked to people’s livelihoods. “Inclusive growth, where everyone prospers, is impossible without solving these problems. The focus should be on resolving them,” Moon said, listing factors such as increasing economic polarization, difficulties experienced by small merchants, and regions facing crisis in manufacturing industries. In October and November, Moon visited the North Jeolla and North Gyeongsang provinces, where he met with government and business officials in the region. Moon added that he will continue the tour by visiting South Gyeongsang Province in the near future. Moon also urged the government to support newly appointed Finance Minister Hong Nam-ki in “breathing vitality and dynamism” into the economy. At the Cabinet meeting, the government also approved a bill on the revision of the Inter-Korean Exchange and Cooperation Act, which would allow the unification minister to limit or prohibit inter-Korean projects with the approval of the Cabinet. According to the proposed revision, the unification minister can take such measures if North Korea violates inter-Korean agreements, poses a threat to the safety of South Korean entities, and when necessary for cooperating with the international community on related matters. The Cabinet also passed a number of other bills approved by the National Assembly, including those on next year’s budget allocation and stronger penalties for driving under the influence.